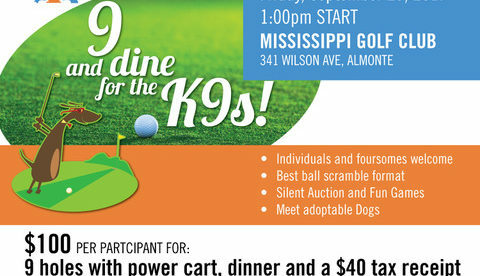 Come and join us for a day filled with fun, laughter, adoptable dogs and golf! Sit With Me’s 2nd annual golf tournament will be held Friday, September 29th, 2017 at the Mississippi Golf Club in Almonte, ON. The cost for the event is $100 per person and this includes 9 holes of golf, a power cart as well as dinner. All paying participants will also receive a $40 tax receipt. The format will be best ball. 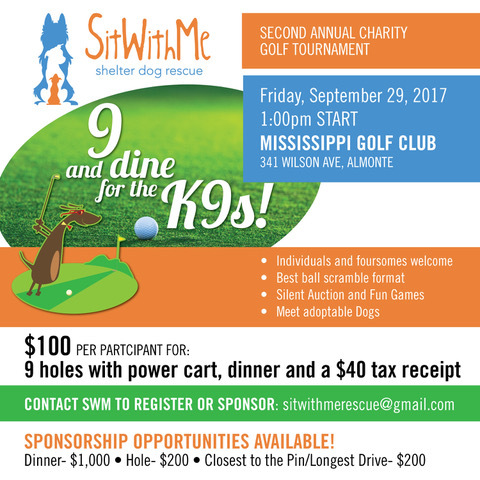 More than just golf, the evening will include dinner, a silent auction as well as meet and greets with adoptable Sit With Me dogs! Fun is sure to be had by all who attend. To buy your ticket for golf and dinner, click the following link: https://goo.gl/S7g4j9. Want to join us after golf for dinner? Dinner only tickets ($30) are also available here: https://goo.gl/dZyWuU. Interested in sponsoring the event? For inquires on sponsorship opportunities, please email Melissa at fundraising@gmail.com. Sit With Me Shelter Dog Rescue presents Nine and Dine for the Canines! Second Annual Charity Golf Tournament. Friday, September 29, 2017. 1:00 PM start. Mississippi Golf Club, 341 Wilson Avenue, Almonte, ON. Individuals and foursomes welcome. Best ball scramble format. Silent auction and fun games. Meet adoptable dogs. $100 per participant for 9 holes with power cart, dinner, and a $40 tax receipt. Contact SWM to register or sponsor: fundraising@gmail.com. Sponsorship opportunities available! Dinner: $1000. Hole: $200. Closest to the Pin/Longest Drive: $200.